Super easy to use, no mess and it works! BEATS ANY PRODUCT ON THE MARKET. Great solution for cat fleas! One of my dogs eats fast, the other I have to hide the taste in something strong like sardines. 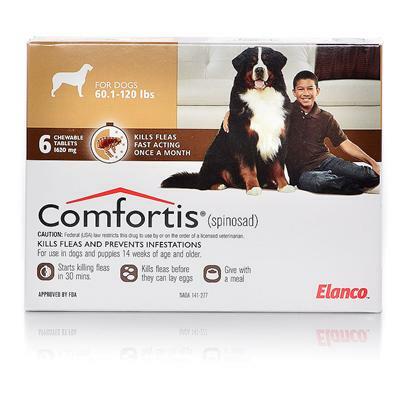 comfortis is the best flea preventive medicine out there! Best flea killer on the market! It works! It doesn't work! The product has always been an ecffective one..
Great Product w/o the wait-&-see worries. This is the BEST flea & tick medicine on the market!! Excellent coverage for flee protection. Tastes awful but works well. This product takes care of the pet. Frontline no longer worked for my dogs and my vet prescribed Comfortis two years ago and IT WORKS!!! The new chewable is no better. This really works for my dog. the kids love the taste!! Wonderful Product! Works like magic!